Written and drawn by Francis Manapul, Trinity #1 focuses on the DCU's big three: Batman, Superman, and Wonder Woman. 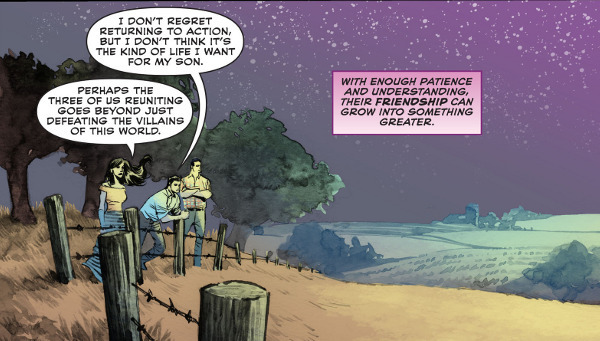 The most low key of any number one issue following the Rebirth relaunch, the first issue of the new series involves Lois inviting Bruce and Diana to dinner at the farm in order to get to know them (and force Clark to do the same). After a brief misunderstanding with Supes, Jr., things calm down quickly and allow the group to spend some non-life-threatening time together. The first issue of the comic proves to be a pleasant surprise. With these three characters providing the pillars of the new DCU it's good to see them together in this kind of setting. Lois and Diana are able to touch on her feelings for her dead Superman without needing to get bogged down in Diana's loss, while the two heroes are able to get a better feel for the new Kal-El in their world. While I'm guessing not all the issues will be dinner's at the Kent farmhouse, this issue works well and sets up the series to explore the relationships between DC's big three. Worth a look.